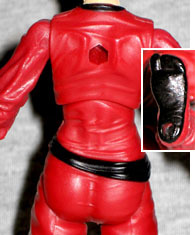 Okay, so this figure is identified, right across the top of the filecard, as "Kim Arashikage." And then down where it shows her file name? "Classified." What?! Kim "Jinx" Arashikage studied and competed in three forms of martial arts from the time she was seven until she graduated from Bryn Mawr. Upon arriving in Japan for a vacation, she discovered that her family had been ninjas for generations, and she was officially initiated into the clan. She was recruited for the GI Joe team by Snake-Eyes. 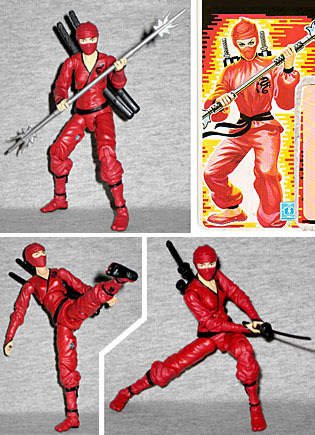 Wait, we know Jinx was raised in the Arashikage compound, because she shows up in photographs of the family when she was only 8-years-old. Now, granted, things kind of fell apart when the Hard Master was killed, but are we supposed to believe that despite hanging around ninjas for the first 10 years of her life, she didn't know anything about their history? What, did she think it was a new hobby they'd just picked up recently? If anything, it's more likely that she would have thought all families were like hers. The original Jinx toy wore a red hood that hid her face, but that was an oddity: in both the cartoon and the comics, she was more often seen without any mask at all - other than a blindfold to practice the techniques the Blind Master taught her. This toy gets a mask, and it's actually detailed like something she's tied around her head, rather than a pre-formed hood. The body is entirely new. Jinx's classic look was basically a red pair of pajamas and slippers, making her the Joe you're most likely to convince your girlfriend to dress up as for Halloween. Today her clothes are tighter, for some reason, but that just means there's a greater level of sculpted detail. The old outfit could have been sweatpants, but this looks like silk or some other thin material. She's traded in her slippers for fitted tabi boots and has black bands tied around her ankles and calves to keep the pants from billowing out at an inconvenient moment. She's showing more skin these days: rather than covering her chest completely, her shirt now shows a flash of skin at the neck. In 1987, Jinx displayed her femininity by painting her fingernails red. 25 years later, she's apparently decided that was too flashy for a ninja. The dark red of her clothes contrasts nicely with her pale skin, and the hems are black. Her black belt sits at a rakish angle on her hips, and there's a black dragon over her heart. Not sure that represents anything in particular, but the original toy had it, as well. Jinx's articulation is great. She has balljoints at the neck, torso and hips, swivels at the wrists, double-hinges at the knees, and "injection molded" swivel/hinge joints at the ankles, elbows and shoulders. The ankle joints are the sort that give the feet a side-to-side "rocker" range of motion rather than twisting, but that just allows for more dynamic poses! Our girl doesn't come with a ton of accessories: just two katanas, a double sheath backpack, and a silver naginata. Those are the same things the original toy had, but they've all been updated. One of her swords has a fully silver blade, while the other is black and silver. Is that supposed to represent something? It's not a reference to anything in the comics, as far as we're aware. Are they suggesting one of her blades is traditional steel, while the other is carbon fiber? Who knows. It's not a factory error, though, because all the figures are done the same way. Continuing the trend of the past five years, Jinx has a variant, though this time it's about more than just paint. While the body is the same, it's been painted white with red trim and gray dragon designs on her right leg and left arm. She comes with the same two swords, though the hilts are now red rather than black - and so are the sheaths. 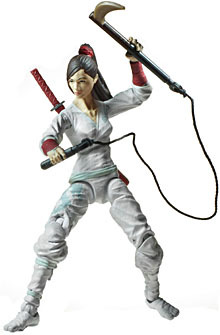 Instead of a naginata, she comes with a kusarigama, done as two separate pieces held together by a string. Also, instead of a masked head, this one is bare. Her hair is pulled back into a ponytail that hangs down below her shoulderblades, and of course, since the molds are the same, you can easily put this head on the red body if you want to. No, it's not the short hair seen on the cartoon, but it's been a few years, she's had time to grow it out. Last year's Zarana sort of made sense as an exclusive, because her design clashed with the "real world" aesthetic Hasbro was going with at the time. But Jinx? There's no way she wouldn't have fit in with the 30th Anniversary crew. A female ninja is way less weird than Sci-Fi or the Techno-Vipers, for instance. So we're sorry to say it, but this is a great release, and Joe fans should absolutely track her down; we're just sorry she'll cost you so much.